Punjab Educators Recruitment Policy 2016 has been announced video Notification No: SO (SE-IV) 2-50/2015 dated 19-01-2016 by Government of Punjab School Education Department. 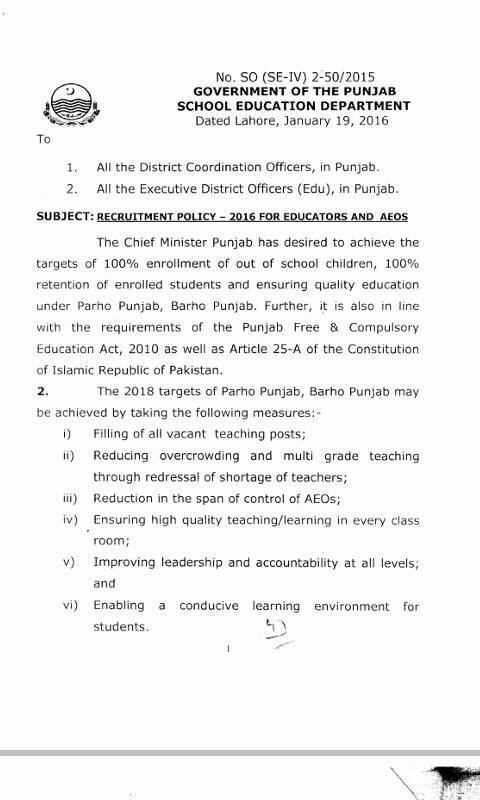 According to this policy 33622 posts of educators and AEOs have been announced in all districts of Punjab. Full detail of Educators Recruitment Policy 2016 consists more than 30 pages. You can read the detail by downloading the pages from Punjab Educators Recruitment Policy 2016. Punjab Educators Recruitment Policy 2016 in PDF. Punjab Educators main teachers ki bahrti k liay 2016 ki policy jari kar di gai.